Here is the back of the bulky, flap packaging that it comes in. It also shows the retail price in Japan. The above photo is taken with flash, so the color looks a lot lighter than the actual item. 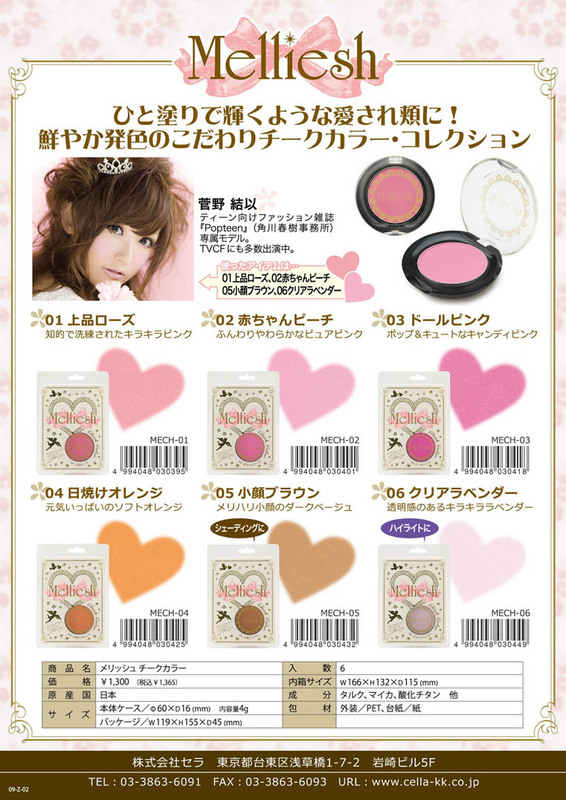 Melliesh is a Japanese Gyaru/Gal Cosmetic Brand produced by Yui Kanno, a former Popteen, current PopSister model. Melliesh along with Dolly Wink and Candy Doll are heavily features in Japanese magazines such as VIVI, Popteen and Jelly etc etc. 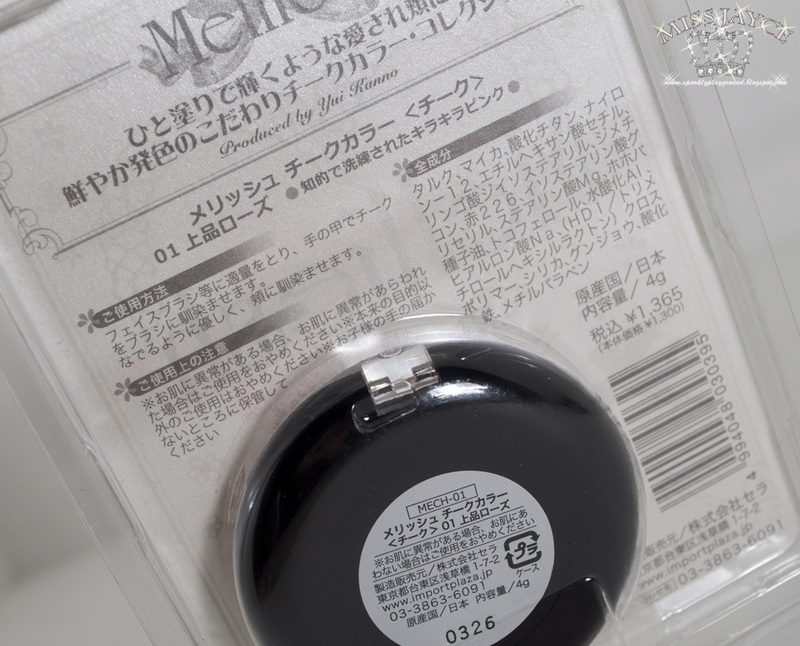 Although on the package of the Melliesh item it says "produced by Yui Kanno", most magazines I've read says she's the spokesperson and face of the brand. I'm guessing she's both. Their line carries blushes, lipglosses, eyelashes and more. I will be reviewing their lipglosses in the upcoming posts. 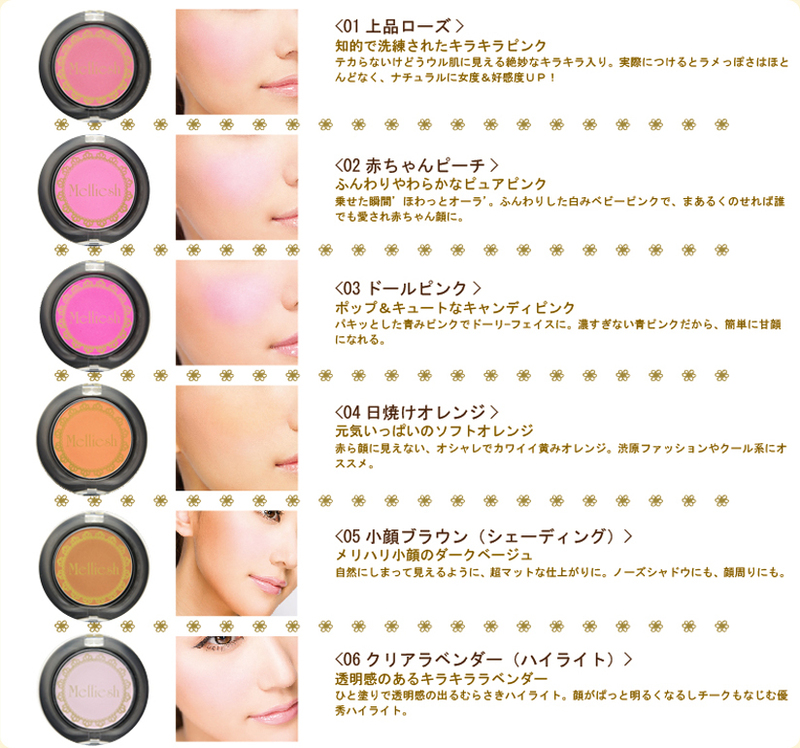 #1 - Elegant Rose "A bling bling pink"
#2 - Baby Peach "Soft and light pure pink"
#3 - Dolly Pink "Pop and cute candy pink"
#4 - Sunset Orange "A healthy soft orange shade"
Retail Price in Japan: ¥1365 JPY tax included. $68 HKD ~ Approx $10 USD for one blush during a sale at Bonjour Hong Kong. $20~25 CAD at Pacific Mall. I believe this was the price since Emily and I were there. It's quite a story how I got these Melliesh Blushes. If you are interested, see this Melliesh Collection Post. It's at the bottom of that post. Althought it's not heavily advertised (well, I can't really read Japanese) and I haven't seen bloggers mention this, check out the ingredients list! This product contains hyaluronic acid and jojoba seed oil! These two are usually my favourite ingredients to have in cosmetics/skincare! To be really honest, I hardly see Western cosmetics contain these sorts of ingredients in their make up, another reason why I love Japanese cosmetics!! 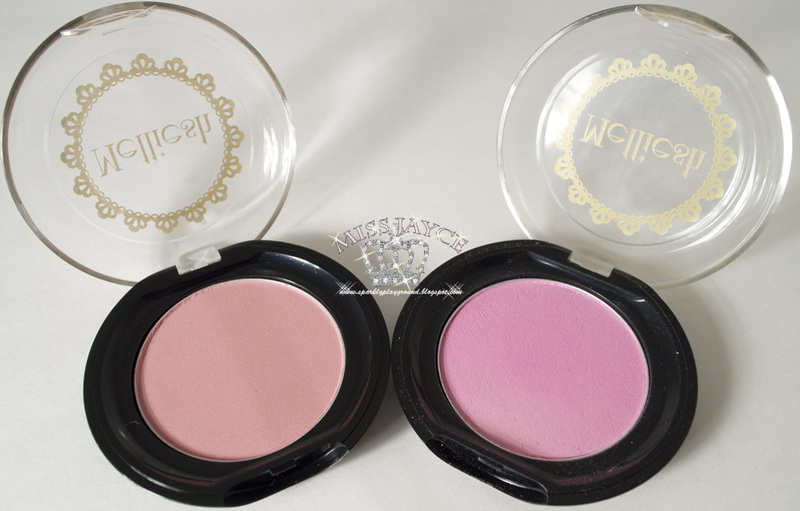 The blush itself is silky, smooth and soft making it blend extremely well. Although it's very silky, it is not chalky whatsoever! I also liked that they are not shimmery. I'm not a fan of shimmery pressed powder blushes. These blushes leaves a natural finish on my skin which is just perfect =) The pigmentation is just right as well, a swipe with my brush and I get the amount needed. Sometimes I would also tap the brush to get excess off. You don't need to build too much to get the color, afterall, most of these colors are light pinks so you achieve that dolly, cute kawaii look. Staying Power is good too, I actually didn't need to reapply! 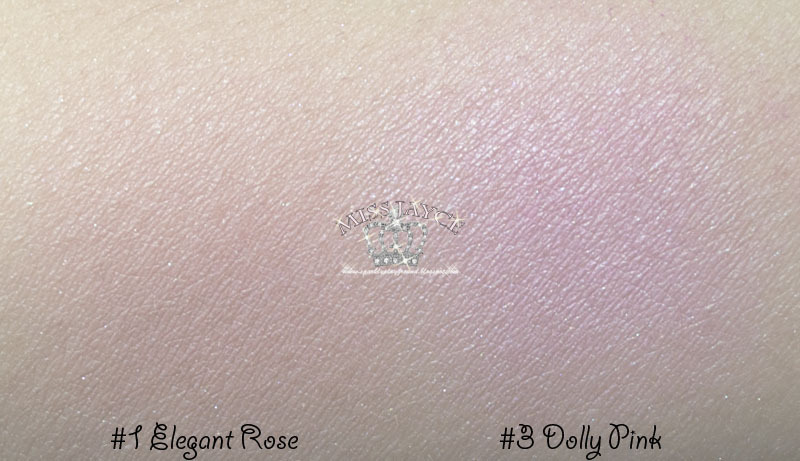 I have tried higher end blushes and I think this blush is definitely comparable. If you are more interested in the color itself, I do think there are dupes out there by MAC, NARS, Bobbi Brown and Chanel. Well I think ELF has a few dupes of this too. Product: 5/5 ♥ LOVE THEM! Packaging: 4/5 ♥ Still kinda bulky. Price: 5/5 ♥ A little pricy if you buy online or at Asian Malls but it's definitely worth it because of the quality, performance packaging and ingredients!